Finding themselves increasingly marginalised, can the indigenous Ogiek community in Kenya preserve their culture, traditions and way of life? Ogiek elders guide visitors through Bobo’s Farm. They wear traditional Ogiek clothing, animal-skin wraps and fur caps. The elders explain the ecological and cultural significance of each tree and plant: the silibwet attracts bees to the Ogiek’s hives, while the septet is used in Ogiek coming-of-age ceremonies. Every living thing here is a vital component of the Mau Forest ecosystem and Ogiek way of life. “We want to bring back the indigenous forest”, says Elijah Kiptanui Tuei, “so that we can practice our traditions”. The Ogiek are an indigenous minority ethnic group of about 20,000 people. For centuries they have hunted and gathered in the Mau Forest – located in Kenya’s Rift Valley – and around Mount Elgon in western Kenya. They depend on the forest for their traditional livelihood of hunting, foraging, and bee-keeping. The forest is also an integral part of Ogiek culture and identity, and it is taboo for Ogiek to cut down any live tree. “The Ogiek are the guardians of the forest”, explains Charles Ruto, the founder and owner of Bobo’s Farm. The 25 Ogiek members of Bobo’s Farm, a conservation and cultural organisation, have access to a small section of the Mau Forest. But this is a rarity – most Ogiek are completely cut off from the Mau. Over the past century, the Ogiek have been continuously evicted from their ancestral land. The British colonial government first displaced the Ogiek, repeatedly evicting them to areas outside the Mau Forest. The British then logged much of Mau and replanted it with exotic trees to harvest for export. The Ogiek, facing disease and starvation as a result of displacement, returned to their homelands after each eviction and hid deep in the forest. In some areas, the British then gathered the Ogiek in small villages and encouraged them to ‘modernise’ by adopting small-scale farming. “Despite all this, we secretly continued to practice our Ogiek traditions of hunting and honey-collecting”, says William Kiptanui Koskei, a member of Bobo’s Farm. When Kenya became independent, the Ogiek’s situation only worsened. The post-colonial government divided the Mau Forest and distributed land to commercial interests and political allies. To clear the Ogiek from valuable forest land, the government evicted them violently. When the government needed more land, it evicted the communities again, each time farther from the forest. The Ogiek are now scattered throughout the Mau and other regions of Kenya, forced to assimilate with dominant ethnic groups. Cut off from the forest, they cannot practice their traditions. They experience discrimination in employment and education, and most are desperately poor. Ogiek suffer during conflict between larger ethnic groups, particularly during volatile election seasons. Kenya’s division and destruction of the Mau Forest has also had disastrous ecological consequences. For decades, the government has repeatedly promised to ‘resettle’ the Ogiek in the Mau Forest, but under the guise of settlement schemes has awarded ecologically sensitive land to politically-connected businesses and individuals. Two government commissions found that the government has allocated the vast majority of excised forest land to non-Ogiek, including senior politicians and companies. In response to the problems they have faced, the Ogiek have been fighting back to have their rights to their ancestral land as an indigenous community recognised. But while they have brought numerous cases before domestic courts to challenge the government’s actions, this litigation has not been effective. Representatives of the government frequently fail to appear in court and ignore court orders. Furthermore, international experts have found that the Kenyan judicial system is plagued by corruption, excessive delays, and judicial bias. The Ogiek have also appealed to other mechanisms – such as the Truth Justice and Reconciliation Commission established in 2008 – but the government has not complied with their rulings. Having exhausted domestic options, then, the Ogiek in 2009 brought a communication to the African Commission on Human and Peoples’ Rights. They are represented by the Centre for Minority Rights Development (CEMIRIDE), Minority Rights Group International (MRG) and the Ogiek Peoples’ Development Programme (OPDP). The Ogiek argued that the Kenyan government’s actions violated their right to life, freedom from discrimination, freedom of religion, right to property, right to cultural life, right to tradition, right to freely dispose of their wealth and natural resources, and their right to development under the African Charter on Human and Peoples’ Rights. The Commission had previously found Kenya to have violated the rights of indigenous people by evicting them from their ancestral land. The African Commission issued provisional measures on 23 November 2009, requesting that Kenya not take “any measures that would cause irreparable damage to the alleged victims and prejudice the case, and in particular, not to evict the Ogiek” until a final decision has been made. The Ogiek and their representatives argue that Kenya has not complied with this request. As the Ogiek of Bobo’s Farm wait for a decision in their case, they work to conserve the Mau Forest and their way of life. RELATED POST: Secrecy Savannah: Is Kenya being Shaped into Africa’s Flagship Tax Haven? Charles Ruto was lucky to be allotted a five acre plot during a settlement scheme in the late 1990s, though it was bare land when he received it, the trees having been razed by a logging company. Ruto took the opportunity to create Bobo’s Farm, a non-profit organisation, and invited Ogiek to join him in reforesting the land. He has invested heavily in the project with his own money despite fears of losing his land through government land-grabbing. The five acres are now lush with trees, a stark contrast to the surrounding agricultural fields. Ruto is a passionate advocate for the environment. Formally trained in conservation, he wishes to share his knowledge on preserving the Mau. Bobo’s Farm invites visitors – Ogiek and non-Ogiek alike – to come and learn about conserving the indigenous forest. Each visitor plants a seedling to commemorate their visit. Ruto also takes indigenous tree seedlings from Bobo’s Farm nursery to community events. “I teach the group about conservation and forestry, and then we plant the seedlings together”, he explains. Ruto has even worked to sensitise local officials in conservation. Bobo’s Farm is about more than ecological conservation, however. It is a space where the Ogiek can observe their way of life and practice their culture. Here in the forest, the Ogiek can grow herbs for traditional medicine and produce the honey for which they are famous, though they cannot hunt as the government prohibits this. They also come together as a group to make decisions – a rare opportunity for a community scattered across thousands of acres. Here, they can teach children about Ogiek heritage and culture. 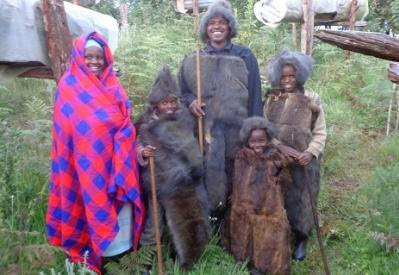 When asked why he wears animal-skin clothing at Bobo’s Farm, Tuei explains, “This clothing is special to the Ogiek. It is unique to us. It is important for us to wear this traditional clothing now because it symbolises our culture”. Tuei and others have planted indigenous trees on their own land to expand the Bobo’s Farm project. Despite its success so far, Bobo’s Farm faces substantial obstacles moving forward. Ruto has run out of money to purchase seedlings and other supplies and so Bobo’s Farm members cannot easily expand the project on their own land. While Ruto’s high profile protects his land from land-grabbers, other members of Bobo’s Farm have less secure tenure. Koskei has planted 20 indigenous trees on his property, for example, but he is at high risk of losing his land – his home was destroyed by someone claiming to hold title to his property. The Kenyan government provides no material or financial support to Bobo’s Farm. Because of their membership in a Community Forest Association, Ruto and other Ogiek are permitted access to five acres of Kenya Forest Service land. There they can grow trees, harvest honey, and practice their traditions. They must pay rent, however, and cannot live or hunt on the property. For the Ogiek of Kenya, forest conservation is a matter of life and death. Their forested ancestral land is inextricably connected to the Ogiek way of life; without it, their survival as a people is threatened. But the Kenyan government shows no signs that it will protect the Ogiek or the Mau Forest. Indeed, in the run up to the 2013 presidential elections, politicians curried favour with voters by promising to open up the Mau for further settlement. Meanwhile in November 2012, the government quietly lifted restrictions on land transactions in large portions of the Mau. This means that holders of illegally-obtained land title can now sell Mau land. The government’s move has the potential to increase violence against the Ogiek, who already feared violence around the election. “The losers will be the Ogiek”, says Ruto.